Conflicting Stories: Was it Bullying? 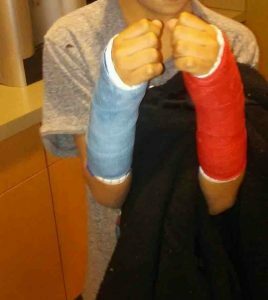 A Claymont Intermediate student is recovering from broken bones in both wrists after an incident at school. A GoFundMe Account has been established for the child where the publisher explains back on March 23rd the student was pushed down the stairs at school. The family claims the child was sent to the nurse’s office where he was given bags of ice to reduce swelling and told he would be fine, but his mother was never notified. The family alleges the child was taken to the E.R. following the end of the school day where they learned he had broken bones in both wrists. “The bullying in school is now unspeakable. We’re looking for possible round the clock care,” explained family members. However, school administration argues the circumstances described by the family are inaccurate. Superintendent John Rocchi confirmed the child did suffer injuries after falling down the stairs at school back on March 23rd. However, he indicated, the family’s account as to how that happened is not factual. “We investigated the incident fully and it was not an incident of bullying,” explained Superintendent Rocchi. He indicated the school has security cameras placed in several locations throughout the building and the footage of this incident has been reviewed. Superintendent Rocchi went on to explain the term ‘bullying’ gets thrown around a lot. The GoFundMe Account has seen $80 donated towards the $3,000 goal to provide in-home care to the student until he’s able to return to school. The fact that the superintendent tried to justify it completely blows my mind. Is this really what the world is coming to? 😕. I fear for our children’s future. Has there been any more information in this story? We are in the process of working on a possible follow up to our initial story. Thank you for your interest. Bullying is bullying!! It does not need to happen over and over!! One time is enough. This Rocchi guy sounds like a joke to me. The same nurse sent my daughter (7 at the time) back to class with a broken arm. We were not notified. My daughter got home from school and informed me that she had fallen off of the monkey bars. The nurse gave her ice and sent her back to class. Her arm was swollen and she was in pain. We took her to the ER and they discovered that her arm was broken. This nurse also failed to inform us when our son had hit his head hard enough to have a “goose egg”. I have been less than impressed with her performance and care for my children. I hope something is sone before anymore children are affected by her lack of knowledge and compassion. We are very interested in learning more about your story. Do you have an email where we can reach you? Or, feel free to send your number to Michaela@newsymom.com if that’s a better means of contact. Regardless if it was bullying or not why was the mother not notified immediately? I pulled my kids out of Claymont my daughter fell of Monkey bars and I was never notified they made her walk all day on her swollen ankle took to ER that evening and her ankle was broken!!! Claymont school nurse is a joke she, I am a nurse she needs to go back to school and learn what a broken limb looks like compared to a simple contusion. We tried to find you on Facebook, but nothing is coming up. Please send us a message and we’ll set up a time to talk about the potential for another article. You can simply search Newsymom in your Facebook search bar and our page should show up. Thank you. This is a joke. Rocchi has never contacted me and they are not working closely with me on anything. There was no report done until i asked for a copy on Monday. I still have yet to see that report or any camera footage. My son is a straight A student who never gets in trouble. I was never notified by the school that he had a accident. My son had to tell me after school hours later. They say he fell but my son is 100% sure je was pushed. They say they’re working with me well they are not. I got a call from the principal askimg for the number to the creater of his go fund me page which i refused to give and stop taking calls but they didnt leave any messages. My son suffered this at school and they are lieable for the simpme fact they did not notified me at all. I will not drop this they are responsible plan and simple and they need to take responsibility for it. This was not my sons fault and i will not back down. All this is is trying to cover their asses because the right protacal was not followed. I am extremely upset and something will be done.